Tired of the same old, same old, for Valentine's Day? Head to St. Louis Missouri and celebrate with adorable, adoptable pets instead! 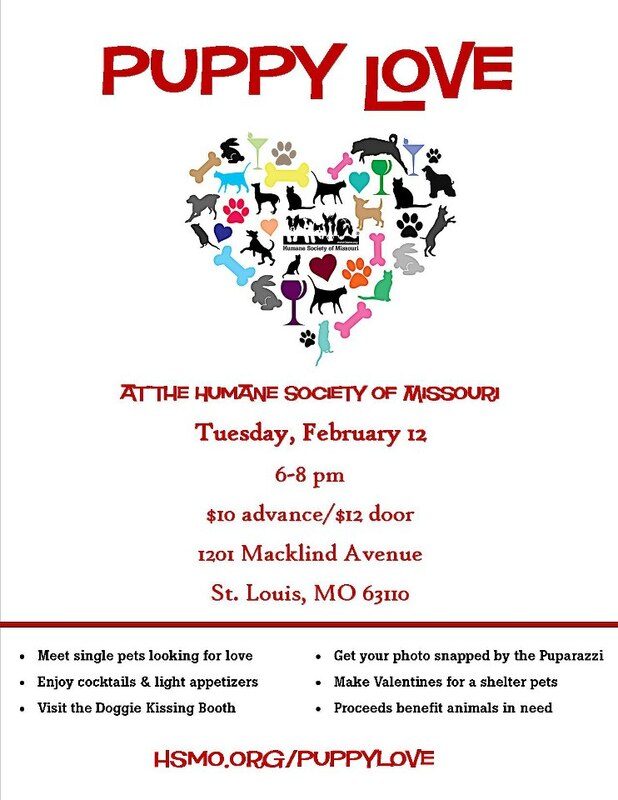 On Tuesday, February 12, the Humane Society of Missouri is having a soiree to remember. Join them for cocktails, light appetizers, and meet plenty of single pets looking for love at this fun, casual event. Your ticket gets you one drink and unlimited trips to the Doggie Kissing Booth! Proceeds benefit the Humane Society of Missouri's Cinderella Fund, which makes extraordinary surgeries possible for injured and abused animals. Since 1870, the Humane Society of Missouri has been dedicated to second chances for animals in need. The Humane Society of Missouri helps more than 85,000 homeless, abused and unwanted animals each year. They operate three Adoption Centers and Veterinary Medical Centers throughout the St. Louis area. Fetch the Humane Society of Missouri on the web for more information. Get your tickets to Puppy Love here. What a fun idea for an event. I am normally pretty anti-Valentine's Day but if puppies are involved I can make an exception!